This is the most beautifully packaged product that I have received in a long time. 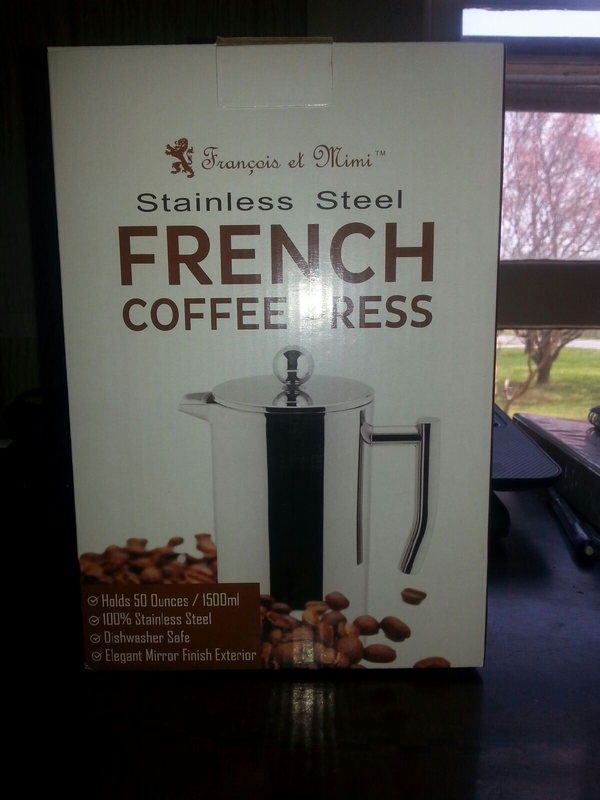 This is a great French press for crazy coffee people like me, because it makes 50 ounces of coffee! Jackpot! Now I don’t have to be greedy and try to keep it all for myself. The press itself is gorgeous, made of fine quality shiny stainless steel and made to last. It is a mirrored finish that is just beautiful. When presentation matters, or serving others you want to impress, this press will surely do it. The double wall really does keep the coffee hot longer, as I only like cold coffee in a frappe! I can’t live without my coffee and I have always thought that the normal auto drip maker was the only way to go. Now I know that will just a minimal amount of extra effort I can have an even better cup of coffee. (And with this one, I can share!) I received this product in exchange for an honest review, and boy did I get lucky!